Last year’s retroactive, record-setting tax increase apparently wasn’t enough for the majority of the Kansas House of Representatives. Now they’ve voted to allow another $210 million income tax increase over the next two years on top of the $1.2 billion increase they imposed last year. And that’s a very conservative number; according to Chief Budget Officer Larry Campbell, the $210 million added to the Consensus Revenue Estimate for the next two years doesn’t include any allowance for business taxes on repatriation of foreign income, which some tax experts predict could be substantial. 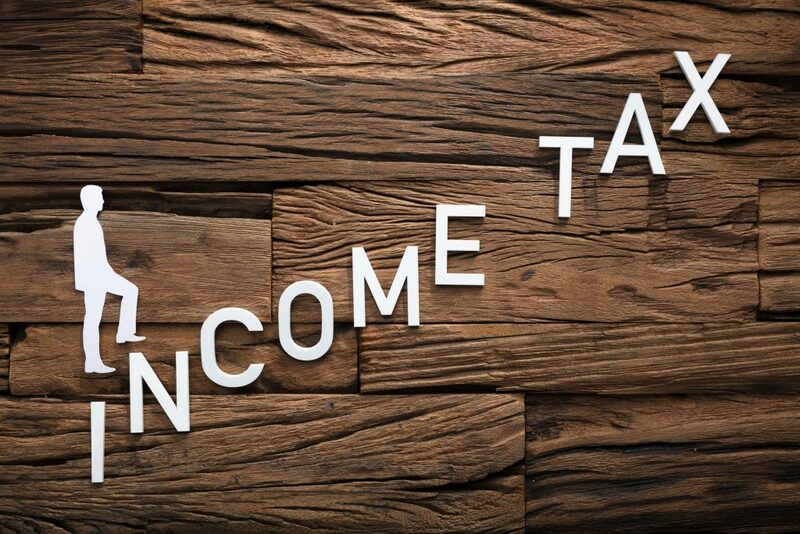 Changes in federal tax law are causing individuals and business to pay more state income tax. The Senate narrowly voted to prevent the tax increase on individuals and business by a 21-19 vote but the House voted to increase taxes; 63 votes are needed for passage but the vote was deadlocked at 59-59 with seven members absent and not voting. Some of those who voted to raised taxes again said they wanted the extra revenue to further increase school funding beyond the $818 million already added ($293 million last year and $525 million more this year) in case the Supreme Court orders more funding next month. The court is constitutionally prohibited from appropriating money and state law says courts may not close schools, but that hasn’t stopped the sitting Supreme court justices from threatening closure if their financial demands aren’t met. Given the choice of defending the Constitutional and rule of law or currying favor with the education lobby, most legislators choose the latter. Claims that income taxes are still lower than before the 2012 tax changes have also been used in defense of the latest tax increase. 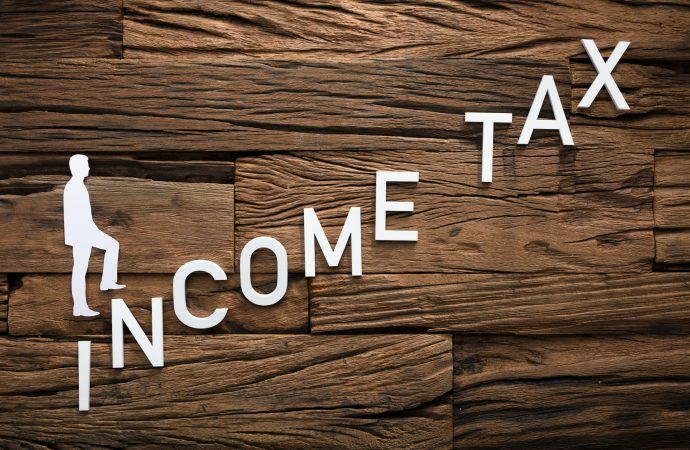 The marginal income tax rates may be a bit lower but the total tax burden is worse due to changes in how taxable income is calculated and a much higher sales tax. Legislators also forced many Kansans with extremely low incomes to pay state income tax that had been exempt under the Brownback plan. The Consensus Revenue Estimate puts total General Fund tax revenue at $6.948 billion for FY 2019, which includes the $210 million effect of the House’s latest tax hike. For perspective, that’s about $1.9 billion more than if taxes had simply been increased for inflation since 1995. 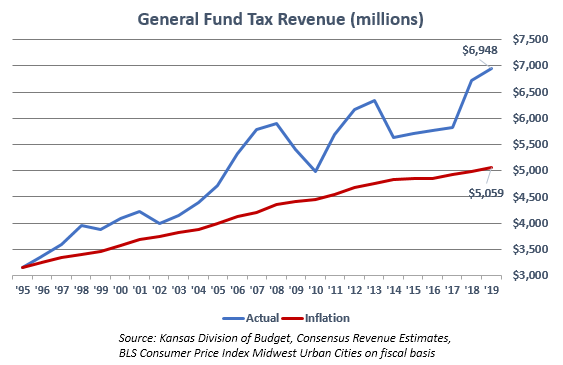 Others defending the latest tax increase say it’s necessary to restore state spending that was cut under Governor Brownback, but spending actually increased during the Brownback years. General Fund spending set new records in FY 2012, FY 2013 and FY 2015 and would have set another record in FY 2016 if pension funding hadn’t been deferred. Legislators used last year’s record-setting tax increase to set another new spending record and the budget approved last week pushes spending to almost $7 billion. 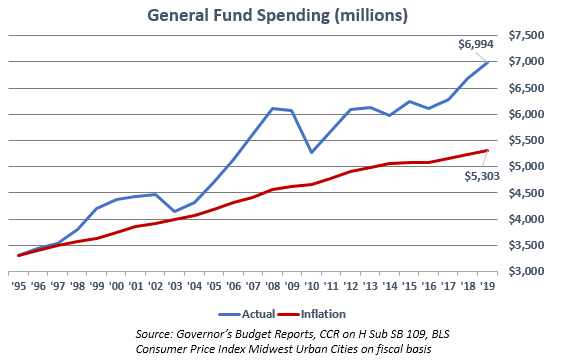 General Fund spending in FY 2019 would be $1.7 billion less if it had been increased for inflation since 1995. Our book on the history of the Kansas tax relief effort – “What was Really the Matter with the Kansas Tax Plan” – explained that one of the goals was to break the 4-decade cycle of economic stagnation. Kansas began falling behind the nation on jobs and Gross Domestic Product (GDP) growth in the early 1980s; the state had also suffered domestic migration losses for many years, as more residents chose to leave Kansas than to move here. New GDP data released by the Bureau of Economic Analysis shows the gap become worse in 2017. 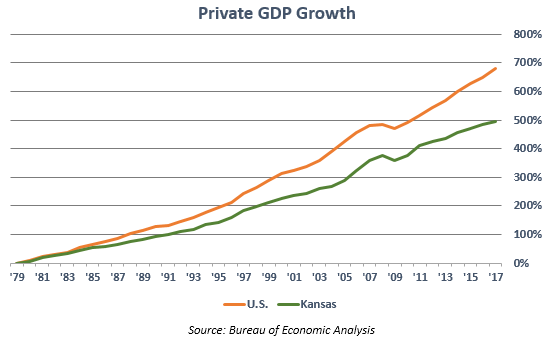 Private sector GDP increased by just 2.1 percent in Kansas, or less than half the national average of 4.3 percent. The new tax increase on top of the income tax increase passed last year for 2018 will only worsen the state’s competitive position. Raising taxes and increasing government spending will make the Kansas economy worse and harm individuals at all income levels. Every state provides the same basic services (education, highways, social services, etc.) but those that do so more efficiently are able to tax less, which benefits everyone. In fact, the research in our 2018 Green Book shows states with lower tax burdens have superior growth in jobs, GDP and wages, and they also gain population from domestic migration. Unfortunately, the majority in this Legislature is more concerned about growing government.